This blog post originally appeared on MDHmusic on February 12 2016, and was reprinted with permission. 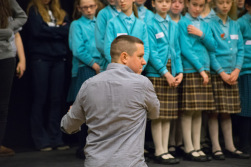 The Voice Festival UK‘s Youth co-ordinator Amy set up this year’s Take the Stage, where schools could come to King’s Place in London, home of the London A Cappella Festival, to participate in a day of a cappella workshopping, arranging and performing. I had a great time working on some musicianship things and a mass performance with this incredibly able group of students from a mix of state and private schools. We also had the privilege of hearing (they were impressive, as ever), being critiqued by (they were impressed) and even jamming with The Swingles. When we performed our arrangement of Walk the Earth’s Shut Up and Dance With Me we inserted an improvisation section to be kicked off by The Swingles. We ambitiously decided that it would last for as many bars as felt right in the moment, and wow, it was incredible – layers of sound reacting and interacting, finding a gentle zone then building and building filling the room with harmonious sound. Thanks to the Voice Festival for organising, to LACF and The Swingles, especially Sara, Clare and Nick who stuck around to hear the schools perform and gave really thorough and practical feedback, and to the students and teachers at Halsted, Marist, Southband Intl and Boroughbridge – keep up the amazing work! Michael grew up in Northern Ireland learning the bassoon and saxophone from teachers and tutors in the area before broadening out into piano lessons and self-taught guitar and singing. He studied at the University of Oxford where he enjoyed the extra-curricular life of orchestras, choirs, plays and open mics, and directed a cappella group Out of the Blue. After 2 years teacher training in Edinburgh he moved to London where he works as a successful freelance writer, arranger, director, producer, composer and performer. This entry was posted in News, Youth Programme by Beth Whalley. Bookmark the permalink.